This one is a little hard to see, but what you are seeing is the remains of a Spinergy Rev-X wheel. Only one bladed carbon spoke and a small segment of the rim remains. Oh god. How'd you come out of that? I've been debating on buying one for a conversion since newer carbon tri spokes and such look too modern for the bike, but I've been really skeptical after finding reviews like this. What'd you do to cause this, and how long did it last? Did you get hit by a car? I've been riding my Rev X's since 2001 and they are still in perfect shape. If you still have the broken Spinergy wheel, Sell me whats left. I need the end caps. That happens during skidding. 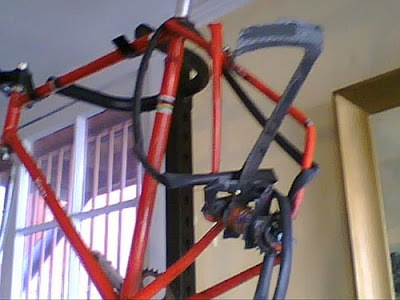 You can clearly see at the rearstay of frame. Carbon bondaged hub/spokes combination is not recommended for skidding because of opposit working forces in wheel > bike system!!! The thin tubes from rear triangle of the cheap frame couldn’t stand these forces. The bonded joinment in the hub came loose after bending the rear stays. I would avoid to convert full carbon wheels into fixed! Not a good idea...as you can see. The super stiff never fails easily by just riding ! I meant the bonded rim of course came loose when bending the rearstay. The joinment from Spikes into the hub shell is still given.